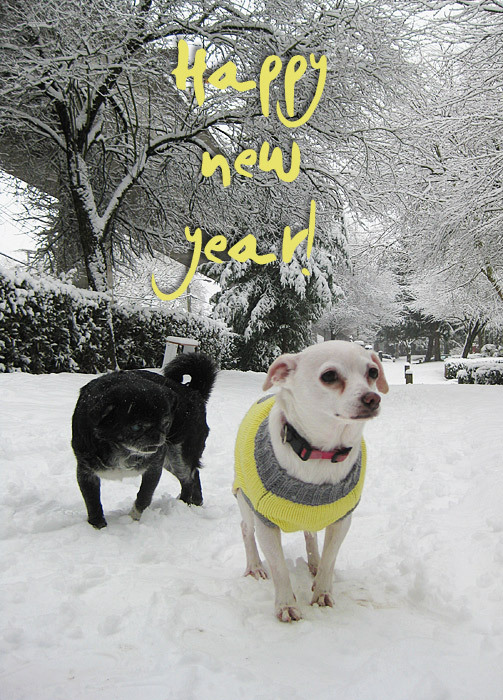 Happy 2014 from my pooches – Princess Sparkle being tortured by a cozy evil sweater & the pug (who is not at all bothered by the snow). Though I have to admit this pic is a little misleading. It is green & rainy in Vancouver these days, but on the rare occasion that it does snow, the whole city shuts down & people go tobogganing down the slightest of hills, scoop up every last snow flake from their lawns to build snowmen & generally get into the winter spirit. Two days later, it’s gone & we’re back to rubber boots. And Princess Sparkle is thrilled to ditch the sweater. For an introvert like me, 6 weeks of selling my work at markets & talking to hundreds (thousands?) of people is really draining. I love it & I LOVELOVELOVE my customers, but even the best conversations with the loveliest of people sap my energy. And I’m not exaggerating when I say I have the BEST customers. You guys are my kindred spirits, my tribe. You squeal with delight when you see my paintings of giant rabbits & awesome robots. You show me pictures of your pugs. You tell me stories about your sassy cats. You rock! Kidding, of course! After the market madness was over, I definitely craved some solitude & some studio time. With the Christmas holidays, it seemed like I was still running around at a frantic pace – shipping last minute online orders, re-stocking the stores that carry my work & trying to get my own Christmas presents purchased, wrapped & delivered. And the studio? A complete disaster that needed a massive clean up & could still use a Martha Stewart type to get it organized. Fortunately a few days visiting my parents gave me the quiet I needed to recharge my batteries. I’m very excited to announce that I…wait for it…read a book. I got to just sit on the couch & read a book. For pleasure! Not a business book or something about marketing, but a book just for fun. I honestly can’t even remember the last time that happened. At least 2 years for sure. One of the downsides of running your own business is that you never, ever have time off. I sold my work at markets for 139 days this year & my days “off” were spent making more stuff to sell at the markets. And ordering supplies. And doing taxes & paperwork. And trying (& failing) to catch up on my email*. With the start of the new year, I’m happy to be in reflective mode – looking back at 2013 & deciding where I want to go next. I’m a goal setter to be sure, but more than wanting to achieve specific goals this year, I’m more interested in what I want this year to FEEL like. I want fun with family & friends. I want cozy quiet days with my pooches. I want to listen to my body more & make time for things that nurture wellness – getting enough sleep, doing yoga, walks along the ocean & in the trees. Eating healthier foods instead of snacking on the go. And I want to make art. I haven’t quite figured out how to make all this happen, but I know I need to make some changes this year or I’ll burn out. I rocked my sales goals for 2013 & this year I’m more interested in slowing down, whatever that may look like. Less market dates & more open studio hours? Hiring some help? Doing limited edition runs instead of trying to make every single painting into a locket, pin, magnet & wood block? We shall see! How do you create ease & balance in your life? I’d love to hear from you in the comments below or hop on over to my Facebook page. *For the record, even though I’m terrible at replying to email, I do read every single one & love getting mail. I usually read them right away on my phone & then plan to sit down & reply to them all in one sitting. And then they get buried. And I worry that after it’s been a week, 2 weeks, 5 weeks…when is too late to reply? This is where an assistant would come in very handy! Previous postLast Market of 2013! Great blog post! You deserve some down-time, busy talented lady. Enjoy that book (dying to know what you are reading). Love this read, feeling much the same in many areas, I’m such a huge fan of your work, I have pins and a broach that I wear on my toque! I get complimented on them all the time and always tell people who you are! Just wanted to say thank you for your artworks! My heart definitely squeals when i see them! “I aspire to create art that makes your heart squeal.” Love it!